I had just reread Huxley’s Brave New World, and the quote struck a cord with me. 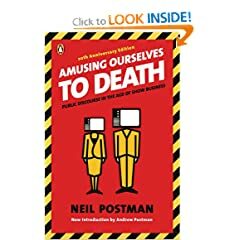 I did a quick search and found that the quote came from Neil Postman’s book Amusing Ourselves to Death. I bought it and found it to be a fascinating read. The first half of the book examines some of the history of communication. In social media spaces, there is an ongoing discussion that the communication content is much more important that the technology (but there is a lot of discussion about the various tools and the appropriate use of the tools). Postman writes that while the message is an important piece, it is impossible to not have the message effected by the medium through which it is transmitted. The same concerns held for television and many have made similar attacks against Twitter and other web tools. I plan to take a couple of posts to look at the internet age as an extension of Postman discourse on the Television Age. As Nicholas Carr wrote, in the age of Google, many have trouble focusing (and I would add that most don’t find the time) on anything more than a paragraph, so I’ll try to keep the posts short. While Web 1.0 is an extension of books, radio and television (1-way communication), Web 2.o is a continuation of the telegraph, telephone and email (2-way communication).